Happy Friday my good people!! I have a very VERY special #FunFriday post for you guys. So on Wednesday, ya girl was nominated for her second blog award!!! Ya’ll, I cried!! This came RIGHT on time!! I had just recently posted on my personal Facebook page that I felt I wasn’t getting the support I thought I should from some of my friends. I was pretty much over it, and some of them by that point. I was extremely bothered by the fact that they would share fights, beefs or something like that and wouldn’t even “like” my post. PS. You’ve been nominated for the Sunshine Blogger Award. See my latest post for instructions on how to accept your award. Yeap, I had the ugly cry going in full effect… I had to take a moment and get myself together. So now here I am with my acceptance speech/blog/post. Well, Im so glad you asked! 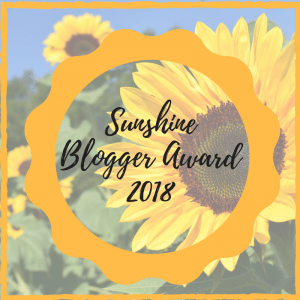 So the Sunshine Blogger Award is an award that is given to bloggers who inspire positivity and creativity in the blogging community. It’s another way to say, “Aye that blog you posted about __________, yea I felt all that”. Once again, this came right on time!! Sometimes when I’m writing, I’m writing because it’s on my heart or it’s something I want you guys to know. I never expect it to inspire anyone because I’m new to the BlogWorld, and I’m just little ol’ me. So when bloggers like The Naked Writer nominate me for awards like I end up ugly crying because it means something I wrote was felt and they actually liked it. As I’ve mentioned a few times, The Naked Writer nominated me for this award and she is a beauty!! I can’t thank her enough for the nomination because it really means the world to me. I started following her when I came across a blog she shared/posted titled Two Weeks after Our Wedding and I Don’t Think It’s Going To Work. How did I come across that blog? Well, a “person” because they don’t deserve any title at this point allowed their friend to send me a text message that said “you’ll be divorced in a year” to gain a “one up” in an arguement… Did that catch you off guard too? If you knew the relationship or title that person once had you’d really flip out, but that’s another story for another time. I had been married for 3 months when that text came through, and when that blog was written. I was like what 2 weeks? Did that text have a point? I read the post and, when I tell you I felt ALL that… I felt ALL THAT. The blog was written with passion, love, and compromise — because THAT’S WHAT MARRIAGE IS. She talked about how yes, disagreements may happen but there is not giving up in a marriage. You know what really got me? She talked about how her and her husband prayed together and “proceeded into what married people do” I told myself if she shares blogs like this, just imagine what she writes!! I immediately hit subscribe and said no jealous (single) text formed against me shall prosper. I also went on a binge and read everything she posted. She was open, she was honest, and was an inspiration to me. She was the type of person I need to follow and have in my life. Go Read her blogs.. ALL OF THEM. What caused you to start blogging? — I really just wanted to talk lol (hence the name Talks With Tati) I really wanted to talk about my breastfeeding journey which I mention from time to time, but then I was like what about everybody else in the world? So I started talking about random things that happen or have happened to me and here we are! What is your favorite book or travel movie? My favorite book is also by my favorite radio personality: Black Privilege: Opportunity Comes to Those Who Create It By Charlamagne Tha God. What types of blogs do you enjoy reading? Anything that I feel feeds my mind, body and/or soul. I read things that I feel I can relate too or learn from. Once again, thank you so much for the nomination!! I’ve only been blogging a few months and to receive this nomination at this exact time really warmed my heart. It’s always nice to feel appreciated and acknowledged and I felt all that and more with this nomination. I can’t say thank you enough!! I’m so freaking proud of you!! Congratulations!! Happy for you. So well-deserved. You’re awesome and your blog is awesome. Did someone actually text you and say that you’ll be divorced within a year?! How rude! My friend recently got a divorce. When our mutual friend found out, she sent me a text out of the blue that read “I’m praying for you and your husband.” It’s bizarre how people almost anticipate your marriage to fail because the divorce rate is high. I have acquaintances that ask, “Are you two still happy?” as if they’re waiting for some news. It’s so unnecessary and rude. Yes ma’am! I still have the text in my phone to this day! It was followed by “if it wasn’t for her your wedding would have flopped”. That was rude, hateful and all the above. It was indeed an eye opener and I understood the meaning of pillow talk. This was such an interesting read and I’m looking forward to reading more from you. CONGRATULATIONS! Your award is so well deserved. I am delighted for you! And how like you to turn a horrible negative into a positive. I can’t imagine that someone would send a text like that to a newlywed. Says a lot about the person who sent it! Congrats Tati! You deserve all things amazing on any given day. Keep posting. You are a WInner! Thank you very much! I aspire to be like you!! Congrats!! I’m so glad you got a pick me up right when you needed it. It’s such a great feeling when we realize our work doesn’t go unnoticed. Blogging is such a rewarding thing on its own, but it’s even better when there are people around to go on the journey with you. Cheers to you & your blog! Thank you so much! This journey has been amazing! I’ve met so many new people and inspirations. Then you have awards like this that just brighten up your day.